I’m not ashamed to admit that I am a tight-wad. Sometimes I look back on things and think, “Wow, was it really important that I saved that $15 and opted out of lunch with my friends?” Or something to that effect. Anyway, there is of course a healthy balance, but I am pretty frugal. So naturally I don’t like to spend a lot at the grocery store. It’s no secret that eating healthy costs a bit more than it otherwise would. It used to make me so mad as a college student that my options for spending a dollar on lunch were either one orange, or a couple tacos at taco bell. It’s a major issue that has a long way to go before it gets better, and unfortunately we just have to kind of swallow the cost. When I got on this health kick, I had to decide what I thought was most important. Did an extra $20 mean that much more to me that I would give up our current and future health? In my case, no. And you have to weigh the cost yourself. I’m not here to talk anyone into anything, or to judge, or scold. I am merely offering what has worked for ME, in hopes that it might help someone out there. You have to do what works for YOU and your unique situation. When you are ready, you will know. Anyway, I am not sure what others spend per week, but my plan has changed over the past few months. When we lived in NY we spent about $80 per week, but we only had 2 adults (and The Mr. ate on the company a lot), a toddler, and a nursing baby. But NOW, I feel like I live with three teenage boys. We eat a LOT of food. I mean, a LOT. Sometimes I will go to the store, and by the next night I feel like all the food in our house is gone. Our current food budget hovers between $350 and $400 for a family of 4. Honestly, I don’t know if that is good, bad, or average, but that’s what we spend. It gives me enough room to buy mostly whole ingredients, lots of organic, and tons of produce, and not feel guilty about it. There are times when I pay more, if we have company, parties, special occasions, etc. I’m still trying to adjust the budget and the process I use, but so far, these are my philosophies. + Eat in Season: In the past I would flip through cookbooks trying to decide what sounded good to me, and then make a list and go shopping. After shopping at farmers markets and Bountiful Baskets this year, I discovered that produce in season tastes significantly better than off-season…and it’s cheaper! + Shop the sales: Before making a menu, I look at the grocery store circulars or online to see what specials they are running, and then try to look up recipes that have those as the main ingredients. This is a big time money saver. + Go vegetarian: We try to eat meat only once a week or less. So far, it’s been working great. The hardest part is finding menu ideas, but once you get going it gets easier. This week we’ve had 5 dinners all with vegetables as the main course. I’m learning so much about foods I’ve never even touched in the past, and discovering a whole new world of flavor. 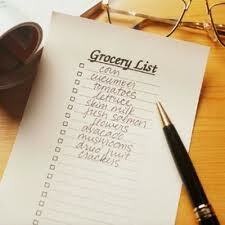 + Shop the Perimeter: Not only are the healthier foods in the perimeter grocery stores, but it saves money too. Produce, Grains, Dairy, etc. – It’s mostly food in its natural form. I do venture into the middle to get some things like peanut butter or maple syrup, but for the most part, the processed stuff I loved in the past I am learning to make from scratch. + Use What is In the House: There is nothing I hate more than throwing food away. Not only do I feel bad about wasting it, the cheapskate in me is crying that it wasted my money. At least once a day I am looking through the fridge and the pantry seeing what is about to go bad. Once a week or so we have a random last-minute dinner that was made from something about to spoil. Tonight it was breakfast burritos with veggies, because my peppers and potatoes and tomatoes were all about to bite the dust. I’ve found that if I always have a few items on hand, I can whip up several last-minute things (see below). I also take an inventory before shopping, in case I have something I need to use up, and then try to incorporate that into a menu that week. + Keep several items on hand: I usually try to keep the following items in the house for last-minute meals. Most basic recipes won’t ask for more than that, and if they do, you can usually find a way to manipulate it. + Only plan 4 meals: This is my best kept secret. We always have leftovers, and we eat it the next night. Even eating this way, one of my planned meals usually ends up spilling over to the next week, because I didn’t end up making it. 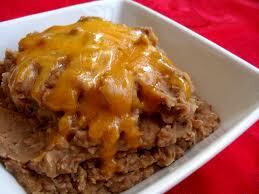 + Rice and Beans go a ridiculously long way: I make rice and beans once a week as a rule. It goes a long way, and we usually have leftovers for the next 2-3 days. burritos (you can always put something into a burrito). That’s it for my tips in frugal healthy grocery shopping. Wishing you all a very Merry Christmas and a wonderful weekend! He has a serious obsession with popcorn, to the point where I have to remove the bowl from his presence to allow others to get in on the action. Since we got on this health kick, he’s slipped into a mild depression because basically every brand of microwave popcorn has baaaaaaaaad stuff in it. If we ever did find a brand without trans fat, it had a bunch of processed stuff or weird butter flavorings and tons of salt. I know– easy solution would be to get an air popper, right? I guess my excuse in the past was WHERE we would keep that bulky thing in our teeny NY apartment. 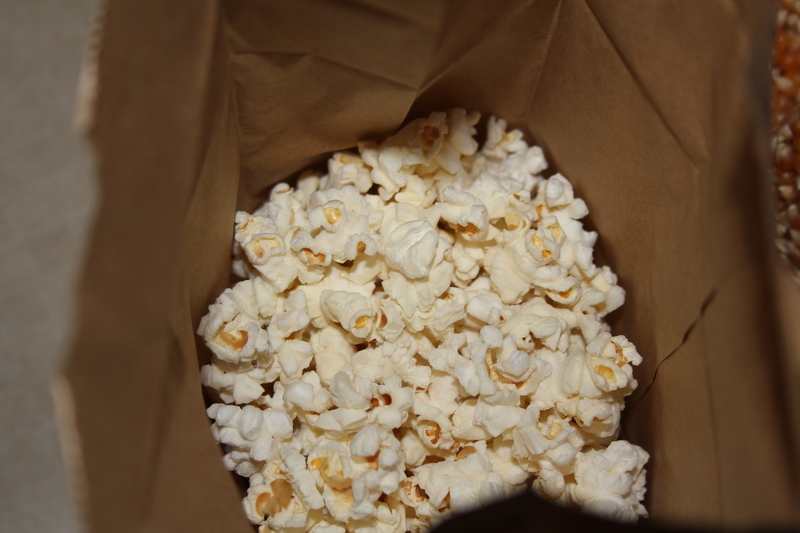 I remembered I had read something about making popcorn in a paper bag a while back so we looked it up and made it tonight. 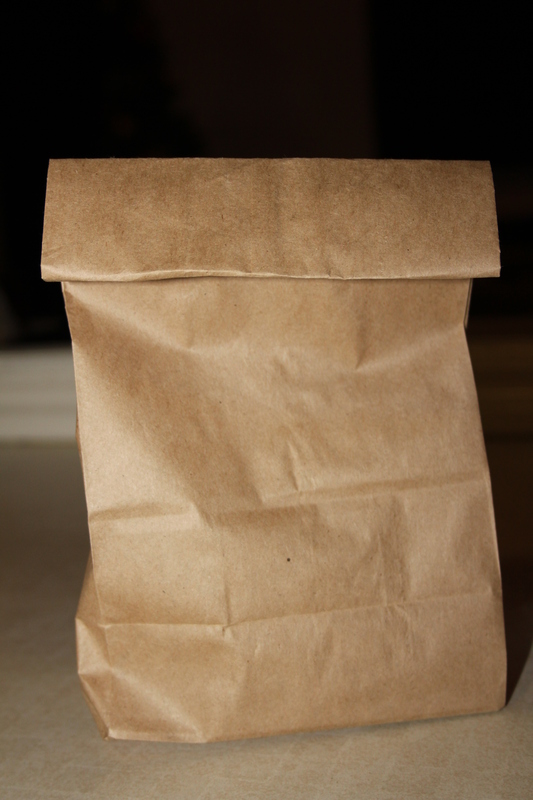 Put the kernals in the paper bag. Fold the top down twice to keep it from popping open. Put it in the microwave for 3 minutes. It takes about 40 seconds for it to start popping, and then it will begin to pop rapidly. Let it go until it slows down and there are about 5 seconds in between pops. Every microwave is different, but mine took about 2 minutes 45 seconds. BAM! I can’t believe this works! How awesome is that?? So you can eat this plain if you like. We put a little bit of melted butter and sprinkled some salt. You can also put other seasonings on: parmesan, seasoning salt, cinnamon and sugar, etc. 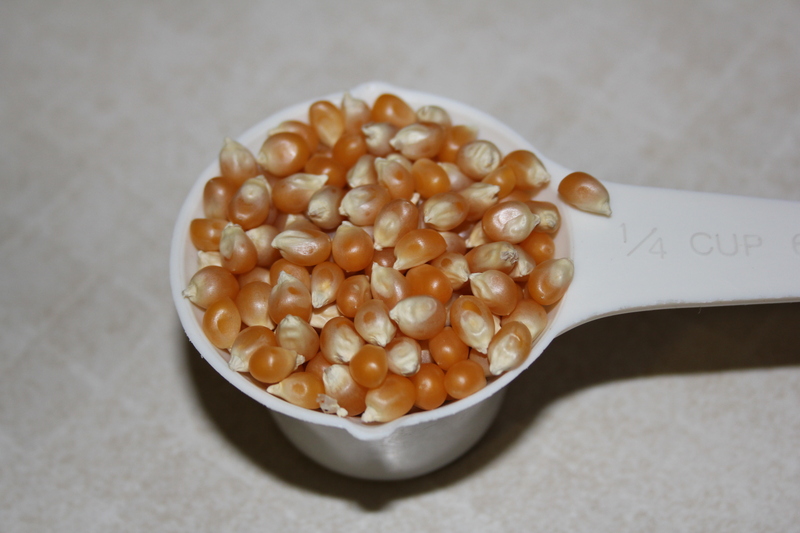 Here’s a great link with some good ideas on homemade seasonings. There you have it. 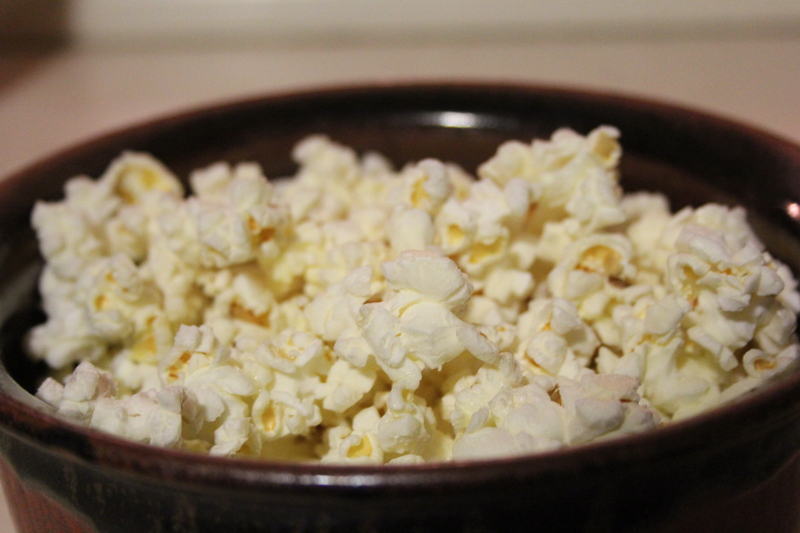 Healthy, easy, convenient, and cheap popcorn! In other news…my 30 days of no processed foods is going…okay. I’ve been really good, but it is challenging! It makes me realize just how many processed foods I was eating before, and I really thought I had hardly any! I will go into more detail tomorrow and give a run down of the past couple of days. When I think of eating pumpkin, I think of something sweet like pie, muffins, bread, donuts or waffles. I’ve never really wanted to try pumpkin soup or other pumpkin flavored meals. But when I saw this recipe for this pasta, I had to try it. And it just so happens that I had my freshly made pumpkin puree so it worked out perfectly. Glad I did it because it was delicioso. I tried it without the sausage, but I’m sure it adds a nice flavor. In a large skillet sauté the garlic in the olive oil on medium heat. Add the turkey sausage and cook until no longer pink, breaking the meat up with your spoon as you cook it. Remove from skillet. Pour the chicken broth into the skillet. Whisk in the half and half, sour cream, pumpkin, and seasonings. Simmer for ten minutes. Meanwhile, boil the pasta in salted water until al dente. Drain pasta and stir into the pumpkin mixture along with the turkey sausage, simmering for another three minutes or until the sauce thickens. 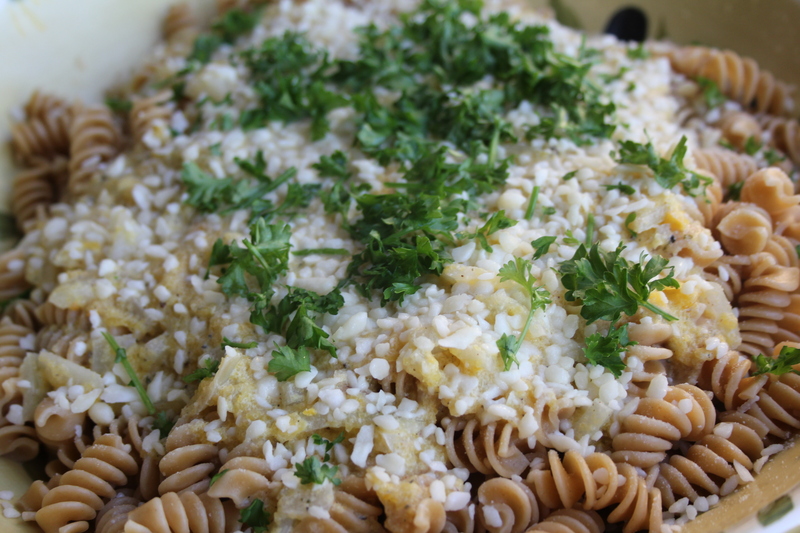 Stir in parsley and garnish with Romano and more parsley. Me: A little too much parsley for my taste, but otherwise YUM. The Wild One: Did not touch it, so I made him take 2 bites before he got down. I said “Isn’t it YUMMY?” He said, “yescanIgoplaywithmycars?” ok then. Tornado: Call him a turkey cause he gobble gobbled it down in .2 seconds. How’s that for some Thanksgiving humor? I’m trying out more pumpkin recipes soon so stay tuned!! I know, I know. The title sounds like a total snore and a pain, right? But trust me, this is a time-saver, a money-saver, and a health-saver (and a flavor-saver, I might add). Many recipes call for chicken, beef, or vegetable broth. 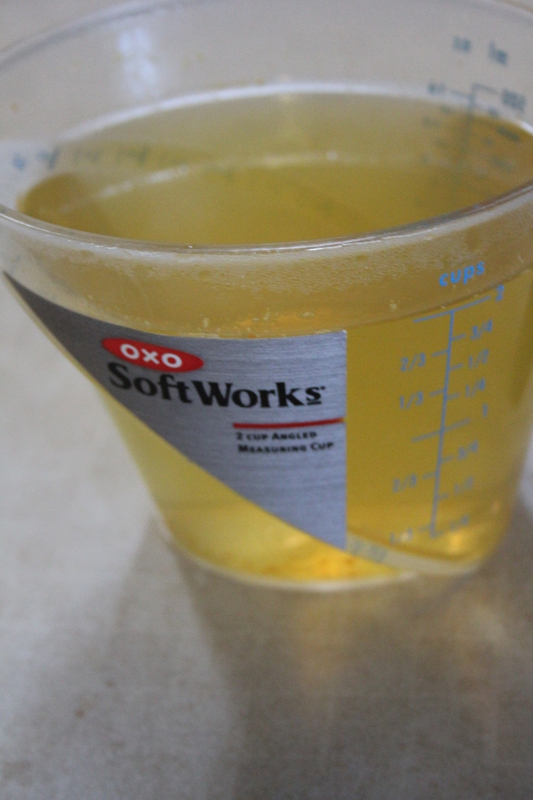 Most canned broths are filled with preservatives, partially hydrogenated oils, salt, and even corn syrup. Swanson’s broth has less of that stuff, but is very high in sodium. And the natural healthy ones are like five bucks a box, so what’s a girl to do? 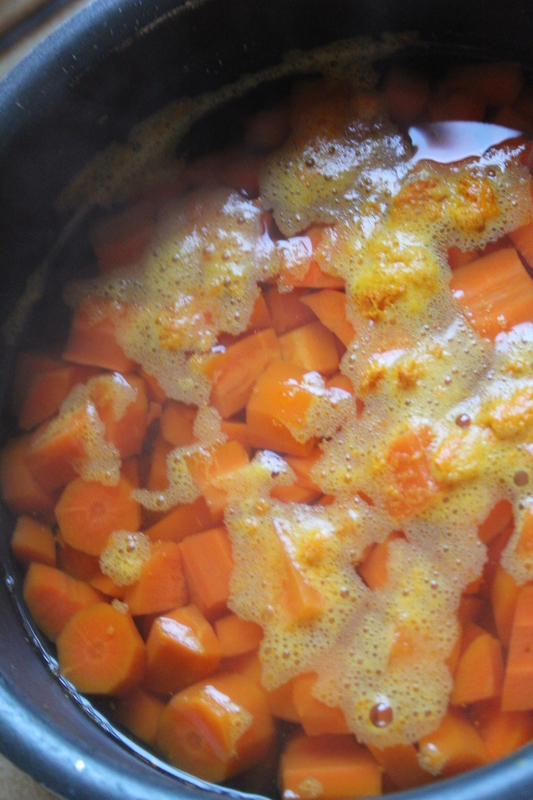 I make a lot of steamed or boiled veggies for side dishes at dinner (I often boil chicken too because it is hard to mess it up and it makes it nice and tender), and I always used to dump out the water in the sink. Then one day I thought…”Why am I wasting this?” I decided to start saving it up for the future. 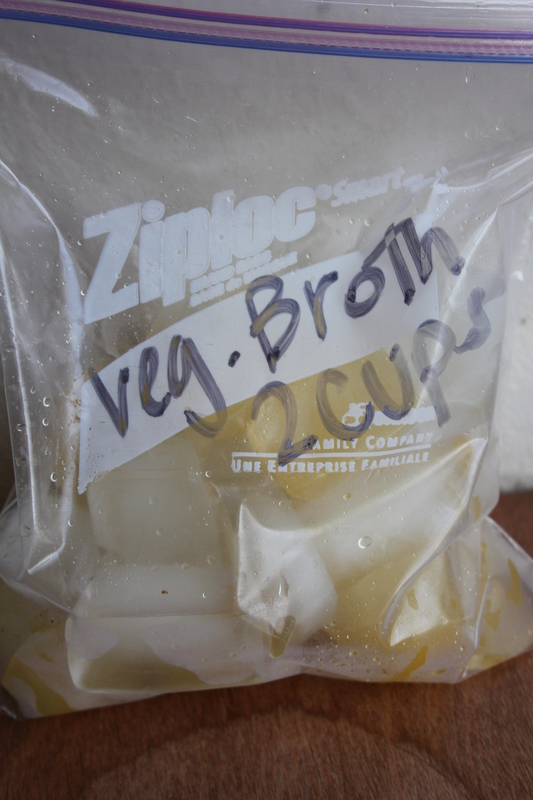 I use vegetable broth interchangeably with chicken broth when recipes call for it and can’t even tell a difference. How great is that? Lots of my motives are cash-driven, so this is a win-win situation. Healthy, easy, cheap, tastes great. 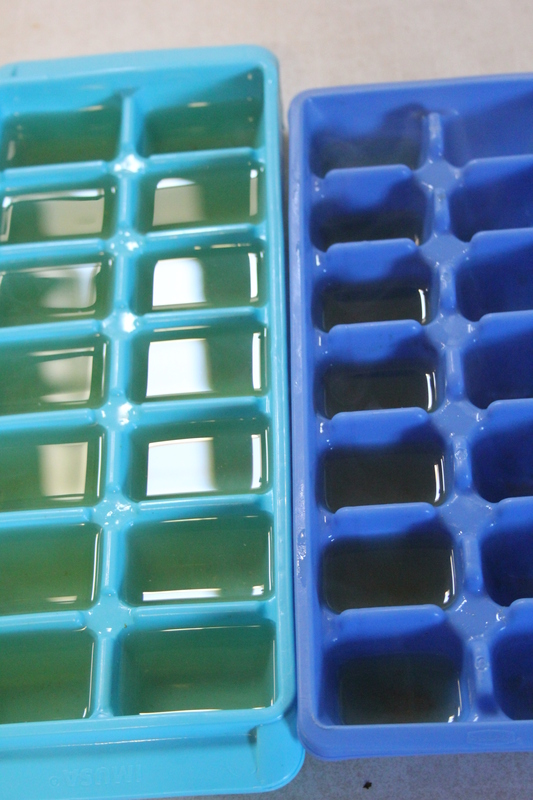 Pour the amount into ice cube trays and freeze it. When it is frozen, pop the cubes into a labled ziploc and store it for months at a time. Great huh? There you have it. No sodium or preservatives. With the cold weather upon us, I am trying to stock up a lot for all those yummy soups and stews. Oh! And you can also use this when you cook rice- it adds such a nice flavor to it!